At a particular URL in the vast virtual world of websites exists something I call the Why Here/Why Now Project. It’s an inactive community interview project, but the website receives as many visits as it ever did. Years after my last interview or commentary was posted, I speak about the project to students in university classes and to professors and graduate researchers who want to do similar work. I learned a few things the hard way during this multi-year experiment. If I knew then what I know now, the Why Here/Why Now experiment might be a living project instead of a relic. We live in an era marked by unprecedented access to tools capable of recording the cultural world around us. Cell phones record hi-definition video and surprisingly high quality audio. Youtube, Facebook, and blogging platforms have been adopted across generations and peppered throughout unlikely demographics. These social media platforms make sharing media easy, which inspires more recording. People record private moments of their lives and publish them to chosen audiences, as if creating an asynchronous life documentary that is hosted online. Children are charted as they grow, houses get remodeled, sporting events are won and lost, gifts are given and received. Moving from documenting your own life moments to documenting those of others is a relatively small step. Once a daily gadget like a cell phone functions as recording gear, the gear is on a quick draw. The digital landscape sets the stage for a new kind of community scholar. Part citizen journalist, part activist, part researcher, the community scholar of the digital age is compelled by a question or the experience of a moment, and armed with a tool set greater than that of any other generation. Examples of this new breed of community scholar who sustains an inquiry long enough to create a project can be found across the web, though you won’t locate them with a nifty search term like “oral history.” In one example, a well-established community garden is threatened when the University decides to reclaim the land use in order to house construction materials during a neighboring renovation project. In an effort to get the administration to reconsider their decision, one of the gardeners decided to interview the others to demonstrate how much value the garden has brought to the urban community. In another example, an avant-garde filmmaker sends a crew on the road to capture the idiosyncracies of America’s hinterland. Through short life stories recorded spontaneously along road sides and creeks, in front yards, and on Main Street, the video interviews are mapped to their location as the crew weaved its way across rural landscapes. While these projects are clearly made of narratives, many oral historians would not consider these to be oral history projects. They aren’t asking particularly historical questions. Those planning and undertaking the work don’t consider themselves scholars or community historians. They are community members compelled by an issue pertinent to their life; they are media makers searching to portray the idiosyncrasies of the human experience. As interview practitioners, they might not even know (or care) that standards for practice exist. They may conceive of themselves as doing different kinds of work. Does this matter? Perhaps. How to interview and what questions to ask is never as easy as it seems, and oral history methodology has much to offer the art of the interview. Recorded interviews that don’t observe a few key standards have limited posterity, and can theoretically lead to real troubles for those who are unaware of the legal and ethical burdens implicit to this kind of work. Clips of interviews posted online can’t be interrogated by later researchers in the same way that an archived collection of full interviews can. And a project led by an individual can be unpublished at any time. It seems that the academic field of oral history has something valuable to offer the public sphere in the digital age— archival infrastructure and basic standards for practice, even for those projects that insist to work on the fringe of the discipline. It also seems that the public sphere has much to offer oral history— nimble, creative response to immediate interest areas of cultural import, on a shoestring budget. Further, fringe projects seeking funding might work from different funding pools than those frequented by the oral history community, broadening both horizons. My Why Here/Why Now Project had humble beginnings. I was in a class, and I needed to focus on an issue in my community. Public discourse in my town was often centered around making decisions to benefit “young families,” but young families were rarely represented within groups of decision makers. I had minor college journalism experience, had blogged, and had built and maintained a website for a regional community empowerment project. I was working on an idea: can a website power a community project? I thought if I could collect the thoughts of a certain number of families, and display them publicly in a visually inviting website, that I could maybe get leaders to listen to the voices therein. And if leaders listened, then the decisions they made for young families might actually serve young families—because leaders would have a deeper understanding of their needs. It was a great idea. But it was also experimental, and implicitly upstart. There would come to be a few key concerns that my particular project would not recover from. As it stands today, the Why Here/Why Now Project is an underdeveloped relic, but it remains useful as one example of how to turn digital narratives into a project with no budget and no institutional support. The questions the process raised for me are questions that face the entire discipline in the digital age. Originally, I created the website project in a class called “Community Journalism: Photography and Oral History” with the late self-styled oral historian/author Don Wallis and documentary photographer Dennie Eagleson. In sum, our work was meant for public consumption; this course was all about applied theory. While we were being schooled in the only oral history methodology important to Wallis (“deep listening” and the importance of allowing for silence and pause), the first assignment was to capture a “sense of place” through carefully considered photography. I hopped on my bicycle, strapped my toddler in the attached seat and helmets to the head of my two older children, and around my small town we went. By the end of the week I had a collection of images that saw the town from a point of view that was somewhat raw and shot “from the ground” (this being how you shoot when balancing a child on one bent knee). While other students planned posters and zines, I went to the Internet. I chose WordPress, a popular content management system (CMS), to power my site. Often considered a blogging platform, a CMS like WordPress allows the webmaster to build an entire website without knowing any programming code. It also plays well with Google (which means your content searches well and can be found by others), and it requires fairly light amounts of resources from the host server. WordPress is open source, with two options to choose from. There’s a free self-hosted version (wordpress.org) that gives the greatest design flexibility but requires purchased server space from a web host provider and a purchased domain name. A somewhat limited version, hosted on WordPress servers (wordpress.com) is another option, and it’s completely free until you would like to upgrade in order to implement customized graphics and other design elements. Using a CMS is similar to using a program like Gmail to manage your email. With WordPress, you log into a control panel accessed at a URL (www.yoursite.com/wp-admin). From your control panel (often called the ‘back-end’ interface in comparison to the publicly viewable ‘front end’) you choose a theme, or visual template for your website. You use an uploader tool to bring media from your hard drive to your server, just as you would upload an image to an email. You type into a text box with formatting buttons on a toolbar, similar to typing into a word processor. You can get fancy or keep it simple— the beauty of a CMS is that you can make changes to the design as you develop your content, usually without too much interruption to your website. WordPress is remarkable because of the vast development community producing plug-ins and templates that are generally more polished than those produced by other platforms. This means you can search for “wordpress themes” and find a template for your web design that looks as if a professional web designer created it just for you. (I highly recommend “magazine style themes” for digital projects, a visual alternative to the one-column blog theme that allows great flexibility in content organization.) You can also search for “wordpress plugin” and find applications that add extra functions to your site. There are plenty of other content management systems. Drupal is notable for its database structure and implicit ability to geo-tag, but generally has less polished templates available to the public. Blogger keeps things simple with the company-hosted one column blog layout. Omeka is an up-and-coming CMS designed by and for academics that continues to develop new features with the needs of the digital project community in mind. No matter which CMS you choose, just be sure your content is portable to other systems. That is, you can export your site (all the posts including text and media) and upload it to a new platform (just don’t imagine it to be a seamless transition— variations in theme design likely won’t transfer and the visual layout may need to be reworked). If you have access to resources for help with one system and not another, you might seriously consider beginning with that system (my digital mentor and friend knew WordPress, hence, I know WordPress). Its structure undergirds the process of trial and error I experienced as I began to create content and publish it online. The Why Here/Why Now Project was always a work in progress. I began with a magazine-style template, “F8,” from a small design firm called Graph Paper Press. 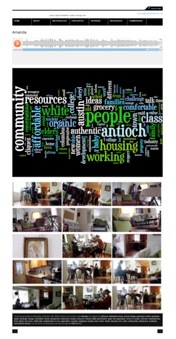 My overarching goal was to illustrate a living moment in my community by curating sense of place photography, semantic typography, and edited audio interview together in a convergent website. As I collected and created content, it fell into distinct categories: interview audio, interview images, my attempts to visualize the content of the narratives, along with images of my town, notes on my process, and other written pieces which were required for class and set the tone for the undertaking. 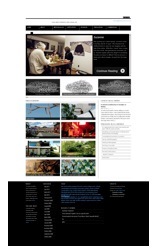 My photography became a category I called “Sense of Place,” the division where I posted all my photography. This category filled the home page with images of Yellow Springs buildings and places, setting the scene for the cultural place (and time) I would be exploring. After saving my images in a medium to low resolution for the for the web, I uploaded them using the WordPress media uploader tool. These groups of images became galleries. If you clicked on one image on the homepage, you would be directed to a new page with a gallery of similar images, and sometimes, an associated narrative or sound file with whatever musings arose during the photo shoot. The main category of my content was my interviews with families in their homes. Each interview consisted of an audio player (to listen to an edited version of the interview), a gallery of images of the family in their home taken before or after the interview, and a visualization of the full interview transcript (a word cloud). As I came to amass a small collection of interviews (some of which have since been unpublished for permissions reasons) the need for a separate collection of word clouds arose. This division of content, called “Community Conversation,” which we’ll discuss later. I had two mentors for this project that influenced its design: one was a documentary photographer interested in exploring lived experience through imagery, one was a fringe oral historian who was interested in the power of listening to spoken narrative to understand the depths and nuances of another’s lived experience. I was completing a classics degree—steeped in philosophy and the “narrative turn”—and had been using the creative process of multi-media blogging as my escape from the linear and difficult texts I was dealing with in class. I was looking for a way of interviewing people that would meet each of our expectations. The best way to describe the natural trajectory of the interview sessions is an abbreviated life-story approach. Interviewees would talk through a brief history of their lives and how they came to find themselves in Yellow Springs. Then the conversation naturally trended toward the thematic areas of the form they had used to become involved in the project. I didn’t have to guide the questions heavily as interviewees understood the breadth and depth of the project because of the pre-interview process. Typically, the interviews would turn reflective towards the end, in some ways branching beyond the thematic areas of the interview project into big life questions and value statements. During my first stage of project design, my professors and I pondered at length about whether these interviews would ever actually be listened to, and it seemed like my opportunity to learn production skills would be missed if I simply placed the full-length interviews online. Complicating the scenario were a couple redacted potions of interviews, where an interviewee realized that they were uncomfortable speaking about an individual person or organization so frankly on the “online record.” We decided my interviews and photos would be produced into three to five minute slideshows using a tool used by the New York Times— Soundslide. But quickly it became clear that editing one to two hour interviews into succinct three to five minute pieces would result in a great loss of thought and context. I also struggled with how to present the interviews. The slideshow format was prohibitive, because I wanted to linger on a certain image while I listened to the audio, instead of passively watching the images flash by. The resolution was to publish an edited version of the audio interview with a gallery of images beneath it. At first I used WordPress’ media uploader, and later I hosted the audio with Soundcloud— an audio social media platform with enormous potential for the oral history community. In the end format, you could listen (play, pause, rewind or fast forward) while trolling through a gallery of full size images at your leisure. The audio hosted on Soundcloud was visually indexed right on the visual audio wave form to aid a listener to jump in at pertinent moments. But the loss of context in editing the interviews still troubled me greatly. I wasn’t trying to create a series of stories, I was trying to create public dialogue, or even influence public policy. The loss of context and descriptive narrative seemed unacceptable in that context. I turned to a tool I had used to visualize difficult texts in my classics program: Wordle. Wordle is an algorithm program that creates a typographic image out of text by weighting the number of times a given word appears with a greater font size. It is free to use, and is as easy as pasting text into a window and receiving an image in return. Wordle to generate a word cloud, I felt I could make some headway towards representing what was lost in the audio editing. Wordle’s algorithm is uniquely amenable to this use, as people tend to repeat what is important to them over the course of a conversation, creating definition in the typography. But as the project developed I had a better idea. What would happen if you combined the transcripts from multiple interviews into one graphic? Could you create some sort of blooming community conversation that shifted its typography with the addition of each new voice? In combining the first two interviews, I was both surprised and not at all surprised. It was a classic representation of my community’s mantra. What is important to young families? 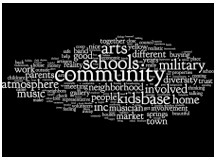 “Arts, schools, community.” It was as if the Wordle image bottled the obvious Zeitgeist of the town. But I had lived in the town long enough to know that this zeitgeist wasn’t the only view around, and I had created this project to develop a nuanced take of the needs of young families. I wasn’t intending to fly the “Arts, Schools, Community” flag, as important as those aspects of life are. When I added the 3rd interview to my community conversation something unexpected happened. My image turned suddenly provocative. Amongst other big bold words was “white springs.” No single interviewee ever spoke the phrase. But what did happen was even more interesting. Across the speakers, the word “white” was spoken almost the exact number of times that the words “Yellow Springs” were. In its jigsaw-making manner, Wordle abutted and adjoined those words, it was simply a good use of space. But I could have never teased the prominence of the talk on “white people” and gentrification and diversity out of three separate interviews. Diversity is a deep rooted theme in my community, and one that is hotly debated in recent times. Using Wordle as a narrative visualization tool provided me with an opportunity to pause around that question… does “white springs” mean anything to you? Whether or not this experiment can actually tell us anything about the meaning contained in the interviews is questionable. It may be that it is simply a visualization tool more than anything else. Other tools can examine the relationship between words in context (like the tree mapping tool in Many Eyes) so that meaning is kept in context. For instance, the word “community” is prevalent throughout my graphics, across all interviews. But I have no way of knowing the different ways in which that word is used, an issue that was raised at a conference where I presented the project. Ideally, I could have explored this question further by importing my transcripts into Many Eyes, a set of digital tools provided by IBM for use by researchers. It is free to use, with a catch. You must open source your dataset for other researcher’s use. My informed consent process simply didn’t allow for this. In fact, my experience with this project suggests that the digital age pokes holes throughout what we think an informed consent process should look like. Not long after I began, I realized that I lacked the foundation that I needed to continue interviewing. My release forms originally didn’t recognize the dual copyright inherent in the oral history process, and didn’t provide for deposit in an archive should I have decided to develop a relationship with one. The process of editing an interview into short clips for online consumption stressed me deeply— so much was lost in the edit. Soundcloud would have allowed me to visually index the full interviews (highlighting clips but keeping them in context of the entire interview), but I only asked for permission to publish the clipped portions. Then, one of my interviewees entered a custody battle and suddenly a heart-felt but sweetly self-critical reflection on parenting didn’t seem appropriate on the internet. We pulled the interview when we couldn’t find a definitive “absolutely not” in response to whether an online interview could be used in a legal discovery process. I was told I was doing very interesting work, but that it wasn’t really oral history. I pushed on, driven by the fulfilling sense I got through interviewing, but I was increasingly concerned that there was a right way and a wrong way to do it. So I delved deeply into the ethics and standards of practice put forth by the Oral History Association, the American Folklore Society, and the Association of Applied Anthropologists. Somewhere in that quest for Right Practice, I stopped moving the project forward. My questions turned from “how should I do this work” to “how should this work be done at all?” A feature article on the project in my local newspaper led to a job offer as a reporter, and the active phase of the Why Here/ Why Now Project was officially closed. But an interest in methodology, ethics, and project design in the digital age have occupied me ever sense, and I am left with questions. There are community interview projects out on the internet that are collections of voices on important American trends that very much mark the “now” of our present age. One of the projects could give a future researcher insight into the roles of community gardens in urban areas, the scarcity of fresh foods in the urban core, and the social role of shared gardens in urban community life. That project could be of interest to a future researcher with interest in land use policies, land owner rights, and the commons. It could document a pivotal era in a particular university’s history. Or, one day it could simply cease to exist. The rich portrayal of rural life in Interview Project challenges, in many ways, the stories we tell ourselves about who America is and how we live. You will find no kitchens that look like magazine spreads or television series sets in the vignettes. Just real people living real lives in the year 2011— 121 individuals whose life story vignettes are geo-located and include high definition footage of the interiors and exteriors of homes, and possessions and businesses and landscapes. Imagine what patterns, trends, conformations and challenges someone working on cultural theory or a particular area of interest within American studies could do with access to that collection. But one day, it too might cease to exist. If these interview projects had a collection of interviews set aside at an archive, it would matter less that the digital project had powered down. Ideally, its design and code might have been captured, but preserving the full narratives for posterity is key. Who bears the responsibility of outreach in the digital age? Should practitioners and archives wait for people doing narrative work to self identify as oral historians and come to us for standards and infrastructure? Or, in the digital era where everyone carries recording gear in their pockets, is it our responsibility to make our infrastructure and standards relevant to the kinds of narrative work happening today? The community interview project is stylized, nimble, and “fresh.” If it will be anything at all in the long run, it will be because the full interviews were archived and made available. So find an archive that is capable of holding your interviews into perpetuity. ­ You owe yourself and the interviewees that much for undertaking the work to create them. Do not misrepresent the spectrum of promises that can be made in the digital era— it’s all about access. Don’t promise privacy and wind up land locked within great narratives you can’t use. Come to the work with a deep sense of your ethical burden to your interviewee, but don’t get hung up on standards for practice that may or may not be relevant in changing times. And have fun. Apart from your archive connection, all you really need to begin your own experiment is a question, some gear, and a particular URL with a CMS. Bryan, B. (2012). Why here/why now: using websites to power community projects. In D. Boyd, S. Cohen, B. Rakerd, & D. Rehberger (Eds. ), Oral history in the digital age. Institute of Library and Museum Services. Retrieved from http://ohda.matrix.msu.edu/2012/06/why-here-why-now/.